This passage alone contains multiple descriptions of Jesus – it’s detailed! Where He stands – in the midst of the seven lampstands, representing His church. What He wears – a garment down to the feet with a golden band/sash around His chest. The colour of His hair – white as wool, white as snow. His eyes – like a flame of fire. His feet – fine brass refined in a furnace. His voice – like the sound of many waters. What He holds – seven stars, the seven angels and messengers to His church. In His mouth – a sharp two-edged sword and goes out from Him. His overall countenance – like the sun shining in all its strength. The first “key” Corey explores is this: “The book of Revelation is all about unveiling the beauty and glory of Jesus Christ”. 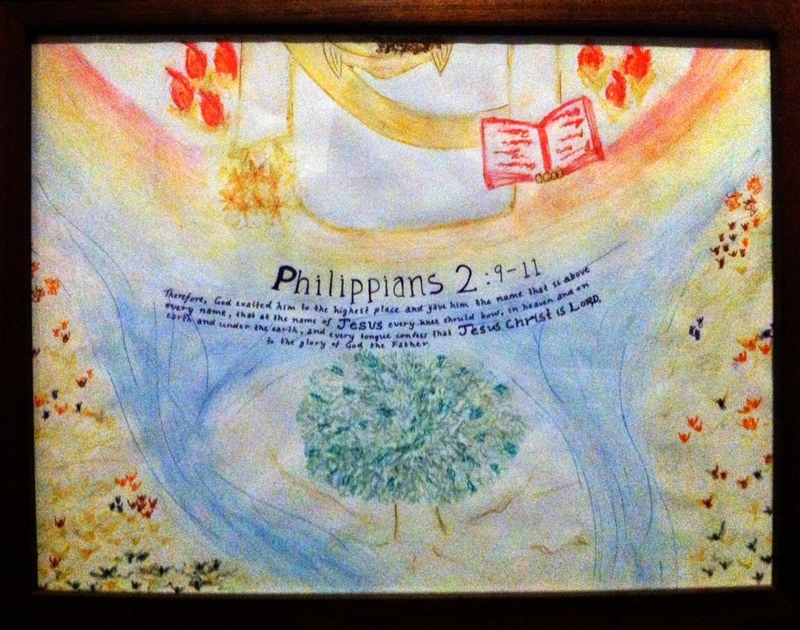 I made two lists as I went through Revelation 1 – one in which I grouped characteristics according to “titles, attributes, and descriptions” and another in which I simply wrote the descriptions as they occurred in the text. It was initially quite hard to keep writing down the descriptions because I felt like each description held so much to explore! However, I did eventually manage to compile a list of brief descriptions and it was interesting to look back over them as a whole. When I meditate on just one aspect of Jesus, I get to go deep into one detail of His person – for example, I focus in on His eyes and learn how He sees things. I learn how He sees the earth, how He sees the Father, how He sees me, and how He sees particular circumstances. I learn about His response as He looks back upon these things with His perfect love and justice. 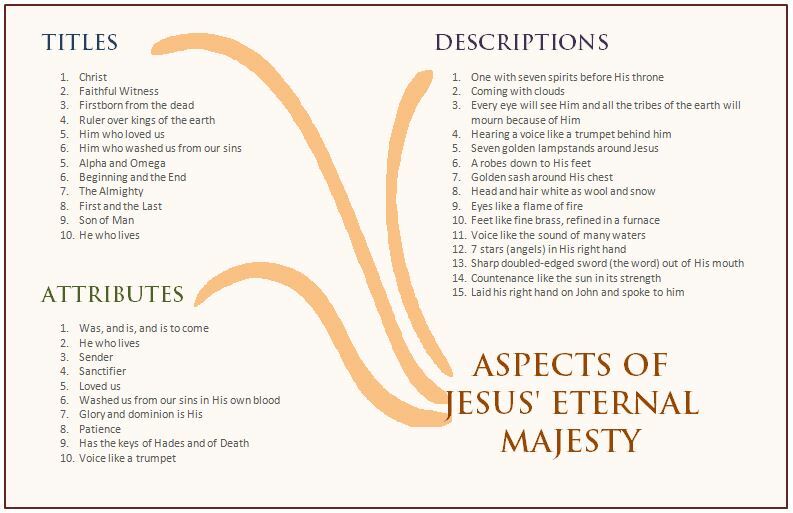 When I look at all these descriptions as a whole, I gain a picture of Jesus’ vast majesty. If just one aspect of His eternal majesty, his eyes for example, can overwhelm me, how much more does a glimpse of His whole glory strike me with awesome wonder? It’s hard to explain but it’s amazing! So, here are some descriptions of Jesus – by no means a full list, but it’s a start and perhaps you can expand on it! Click the picture to enlarge it and view the descriptions by categories. Since He was firstborn from the dead, He knows the power required to raise the dead to life and that power is found in Him. He is faithful witness because He has seen all God did from the creation of the world and He knows the will of the Father. He has witnessed all that is in the Father’s heart and He proclaims these things faithfully and perfectly in accordance with the will of the Father. Psalm 2 – He has overcome them even when they sought to destroy Him because the Father has given Him His authority. All things were created through Him and for His glory – all powers and dominions belong to Him, and the kings of the earth bow to Him because all that is on the earth and under it and all in them belong to Him. He restores us to kingship and priesthood, so we can serve before God when previously sin had separated us from Him. All will see Him, even those who pierced Him and they will mourn as they understand who He is. There will be a day when the full glory of God is revealed. He was there at the very beginning with the Father –> He created all things and they exist by Him. He will be there at the very end –> He will bring justice to the nations and set up His rule –> this will be the fulfilment of the times and of the Father’s will. In trials, in our unfaithfulness and in sin, Jesus is patient but NOT tolerant since He is also JUST. Jesus is patient in His forgiveness. Jesus speaks with a voice that is clear and loud, that proclaims, and that heralds a message. Jesus is completely human, yet fully God. He stands in the midst of His church and He wears a King’s robe. He shows us His revelation, then sends us out to tell His church what He says, and who He is. His holiness is as blinding as the snowfields (blinding white). When we see His holiness, we cannot see anything else. He is the ruler of heaven and the creator even of the heavenly creatures. This is the word of God spoken with power and authority. It pierces for increase of love, and pierces for justice. How will the word of God pierce us? Will we be sanctified or destroyed by it? We fall at His feet when we see His unveiled glory. He knows the will of the Father perfectly and He know how all things will turn out. He holds the map of all history and time in His hand and He knows its plan.